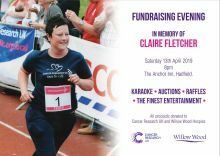 The Anchor Inn, Hadfield is holding a fundraising evening in memory of Claire Fletcher. Starting at 8pm on Saturday 13 April there'll be lots of fun to be had with some great entertainment, karaoke, auctions, raffles and more. All proceeds will be donated to both ourselves and to Cancer Research UK.